REGENESIS simplifies the environmental remediation process by providing industry-leading solutions including remediation products, technical support, and the option for expert, in-field application services. As a result, our environmental consulting firm customers benefit from a streamlined process which uniquely brings both product and technology application together with a high-degree of certainty. Since no one knows a product better than the manufacturer, this unique arrangement saves time, energy and money for all parties involved. 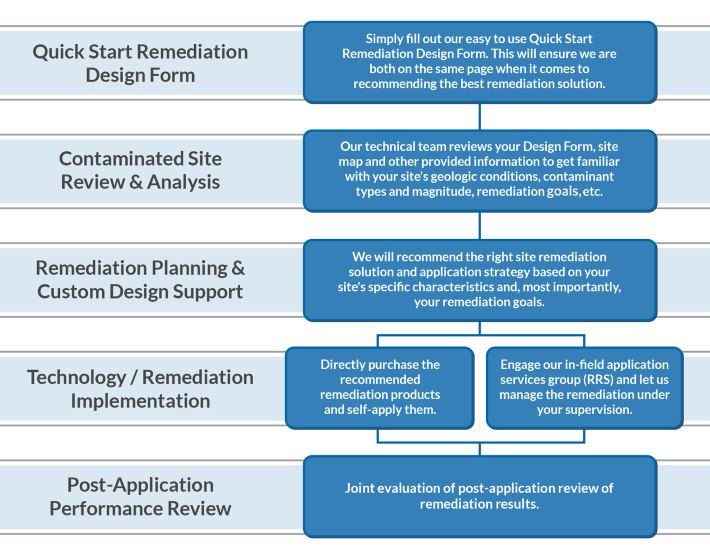 If you have a remediation project and are looking for a solution, we can get started working with you in just a few steps. Since you know your site and its challenges better than we do. It will save us both time and energy if you are able to take a few minutes and provide us with some basic information about your project. This can be accomplished using our Request a Design Form. This step will ensure we are both on the same page when it comes to providing you with the most appropriate and cost-effective remediation solution. If you don’t need a formal site design but have questions or simply want to explore some ideas Contact Us to get in touch with a local representative. No two environmental remediation projects are alike. The same goes for our clients. We are completely committed to helping you fulfill your environmental cleanup goals in whichever way best suits your needs. Whether through hands-on application, or through design and consulting support, we’ll help your team at every step of the process with expert advice and proven technology. Save time and get a quick response with just one step. You know your site and its problems better than we do. Take a few minutes to fill out our easy to use Request a Design Form to ensure we are both on the same page when it comes to providing you with the best remediation solution. Use the REGENESIS Request a Design Form today! Our technical design team reviews your site analysis for geological conditions and the lateral and vertical spread of the contaminants. We’ll also help you determine the right contamination reduction goals based on your local environmental guidelines. We help you choose the optimal remediation solutions and application strategies based on your budget, time constraints and contamination reduction goals. We also take great care to minimize any disruptions to the site’s regular operations. Accelerate your remediation project with our innovative products and state-of-the-art dosing application hardware to reliably ensure optimal results. The best product or technology is of little use if applied incorrectly or in the wrong place. To ensure optimal product performance, our experts will consult with your application team to share best application practices and provide advice. Or, have our in-house applications team (RRS) do it for you. Our team will review and evaluate the success of your remediation project. If required, REGENESIS can assist in regulatory discussions, end-user education and post-remediation application strategy.